Elizabeth trained with bowmakers Bill Salchow in New York, Jean Grunberger in Paris and Pierre Guillaume in Brussels, Belgium. She began her work at Primavera House of Violins in 1982 and went on to establish Bow Studio of Philadelphia. In 2003 she established Mount Airy Violins & Bows in honor of the shop’s present neighborhood. Elizabeth continues her craft and has attended the Oberlin Bowmakers Workshop for over 19 years. Elizabeth plays traditional French, Swedish and old-time fiddle. Adam has played violin for over 20 years, specializing in both classical music and traditional Scottish fiddling. Since joining the shop, he has trained in bow repair and rehairs with Ms. Shaak since 2012. Adam has completed the violin set-up and repair course with restoration expert Hans Nebel, the 2014 and 2015 Oberlin Bow Restoration Workshops, and a 2016 Bowmaking course with David Hawthorne. Thomas received a Masters degree in cello from Indiana University in 2011 where he worked with Sharon Robinson and Janos Starker. He was a Shar Apprentice from 2007-2008. He began working in violin shops in high school in Charlotte, NC doing set-up and sales. Thomas is an active teacher and passionate about providing beginners with the best possible equipment. He has attended the Oberlin Violin Restoration Workshops since 2015. 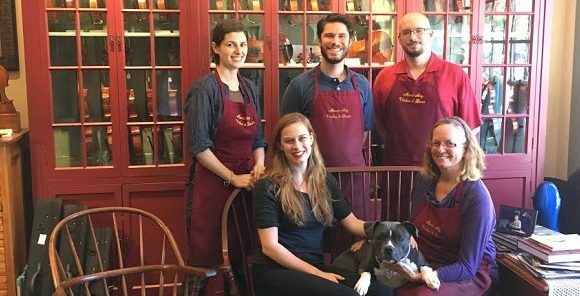 Elizabeth Perry graduated from the Violin Making School of America in 2015 under the tutelage of Charles Woolf, Sang Hun Lee and Aubrey Alexander. She started playing the violin at the age of four and it’s been a part of her life ever since. Fun fact: she is fluent in Mandarin. She focuses primarily on repair and restoration work and has attended the Oberlin Restoration Workshops since 2016. Juliana danced ballet with Pennsylvania Ballet, Maryland Ballet Theatre, Charlotte Ballet and Alvin Ailey. She is currently working on her undergraduate degree in history as a part-time honors student while working for MAVB full time, and teaching part-time at Philadelphia Dance Theatre. Juliana accomplishes the nearly impossible task of paying bills, keeping our due dates on time and our vendors and customers happy. Joe is happy to be back in Philadelphia as a recent add-on to the team at Mount Airy Violins and Bows. As an instrumentalist who used to worry about a trip to the shop, it is his goal to make experiences here welcoming, honest, and informative. Joe graduated from Penn State in 2016 with degrees in Communication Sciences and Disorders and Viola performance, and helped manage the front office at Triangle Strings in NC before coming to Mount Airy Violins & Bows. In his spare time, he can be found reading, memorizing Bach, or gadding about the Play Station Network.